You may remember that a few times now I’ve featured beauty reviews on my blog as, despite the fact that cosmetics/skincare is really not my forté, I seem to spend quite a lot of money on products to beautify myself and I thought it was worth sharing with you the new things I’ve tried over the last month or so, and whether they’re worth a buy or not. I’ve spent a bit more on skincare this month as, where I’ve been feeling a bit poorly I’ve noticed my skin hasn’t been as good. I’m desperate for a really good moisturiser and something to battle away open pores and little bumps under my eyes. If anyone has any recommendations please let me know. 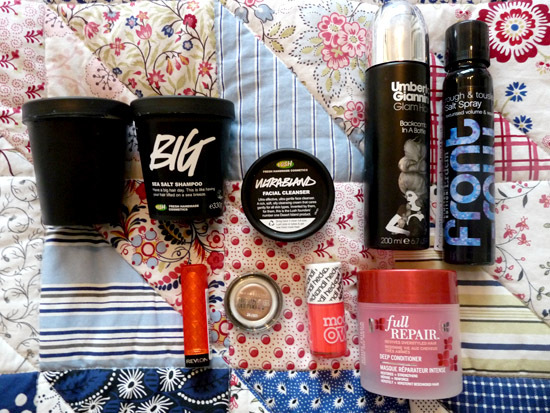 Looking at thephoto, I think I could call the bottom line ‘blogger’s favourite products!’ You can tell I’m a sucker for hype! The blank black pot is a bot of Lush Catastrophe Cosmetic that I made in the Clipper Tea workshop. I’ve been using this a lot lately and really notice a difference in my skin afterwards – it feels baby soft, smooth and soothed. I’ll definitely be getting another pot of this. I’ve been trying not to straighten my hair as much lately so I’m loving any products that leave my hair volumised and wavy after washing. This shampoo is great and definitely does add volume and make my hair feel soft. It’s expensive for what it is but if you use it sparingly it should last a good while. This is one of Lush’s most popular products and was one that I tried at the workshop. The idea is that you cover your face in Ultrabland and then take it off (along with all your make-up etc) with a muslin or cotton pad. I didn’t really get on with this at all, it feels like putting butter on your face and is really oily, and I found that I wear too much makeup for it to be able to take it off effectively as it just spreads it around my face, and I ended up having to wash my flannel every day! I think I’ll stick to face wipes. I use this for creating volume and ‘jujjing’ up dry hair – I just spray it on in sections, underneath the hair and then use my hands to work it through. It definitely gives me bigger, messy hair, which is the look I go for when I don’t straighten. It also doesn’t make your hair crispy like when you use hairspray which is definitely a bonus! This was a re-purchase as I finished my previous bottle. As I mentioned before, I like to make my hair look more wavy to try and avoid straightening it as much and this is absolutely great for that. I spray it into dry hair and then scrunch it and it really brings out your natural waves. It also smells amazing! I bought the Bumble and Bumble Salt Spray hoping that would be even better but it’s nowhere near as good as this one. I’ve always wanted to be able to wear lipstick. There’s always been something so feminine and ladylike to me about a slick of red lipstick. Sadly, it just doesn’t suit me; or, I’ve never found a shade that does. I bought this after the blogosphere started raving about it last month and I must admit that the consistency is nice but the shade I bought looks ridiculous on me and it didn’t stay very long in any case. Again another blogger favourite. I bought this in ‘And on bronze’ and I really like the shade. I tried applying it with my fingers the first few times and managed to get it all over my face, so I’ve been applying it with a small eyeshadow brush and that works much better. It really does stay on all day, and has very minimal creasing. The bronze is a really lovely, summery, shimmery shade. I bought this after seeing Lily’s review here. It’s such a gorgeous, bright colour and definitely perfect for the summer. I’m loving corals at the moment (brings out your tan!) and I know I’ll be wearing this shade a lot over the next few months. Another well reviewed and well loved product. After lots of bleaching my hair can get a bit dry and frizzy and this is really good for making it feel soft and well conditioned again. I leave it in for about 5-10 minutes and my hair feels noticeably silkier when you wash it out. My only criticism is it’s quite a small pot so if you had longer hair I think you’d go through it quite quickly! Have you tried any of these products? What did you think? This month I’m trying No7 Protect and Perfect Serum and the Skin Doctors Potent C Night Cream so I’ll be reviewing them over the next few weeks. I’m also considering treating myself to the Dermalogica Multivitamin Thermafoliant but I don’t know if I can bring myself to spend £30 on a face scrub!